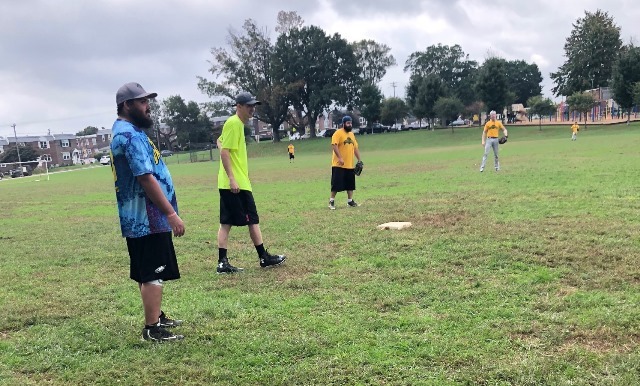 The Millenniun Sunday Fall Softball League does not allow re-tags at 3rd base. It has been brought to my attention more than once this season that a team in the league continues to use re-tags at 3rd base after convincing the umpire it is a league rule. The runner on 3rd base must be in contact with the bag and they must wait for the ball to reach home plate. If any team attempts to use re-tags at 3rd base and the umpire allows it - then tell the umpire it is not a league rule or a USA Softball rule and protest the game. Your team will win the protest and because Millennium Sunday Fall already has had two rainouts the games will not be replayed from the point of the protest and the team who used the illegal re-tag at 3rd base will forfeit. Here's photo from yesterday where a team in Millennium Sunday Fall is shown illegally using a re-tag at 3rd base. The runner on third wearing a neon yellow shirt is 5 feet from 3rd base prior to the pitch being thrown.